As most here know, I've created a special interest Facebook page for my novel(s), called "The Dragonbond Series." My page seems to have picked up several Spanish speaking members of late. It took me a little while to find a common 'bond' between them. This prompted me to access an on-line English to Spanish translator to explain what the page is all about, while trying to generate interest in my books. My grammar is undoubtedly atrocious (you know how on-line translators are! ), but I think I got the idea across. All there is left is for them to read and take note of it. punkin did labels for her vanilla extract in french. "should you not ask someone if that is correct...?" "naw, they know i'm a foreigner..."
also svengelska - swedish/engl, finglish -finnish/engl, the old ingrish, etc. in some time in the future maybe the whole world will speak a blend of all languages? I had a friend who used a translator to convert my reply to them into their language. Although he always replied to me in English, not so bad either, he was curious himself. He had the biggest laugh over what the translator did to butcher my message. I can't remember half of the comments he made about it. But the translation considered many of the words as nouns and replaced the words with their equivalent. A simple phrase like: I'm really tired of working on cleaning up after the flood. Came out like: A true wheel can do employment on shiny high later waters. Most of what he responded with were much funnier, if I could remember them. Another message I sent, he sent the copy back, it was closer. What I said: We drove down to the riverfront to see how high the water got up to. It was into a small town miles from the river and we could not get past that point. What he got, converted back to English. We came to the River to see how high the water rose. It was in a small town by the River miles and we couldn't get past this point. Better, but still made no sense. 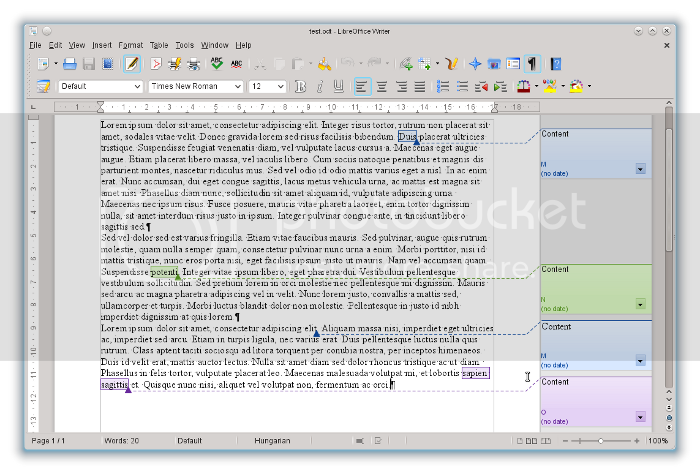 Libre Office has released LibreOffice 4, a major upgrade. As an author, there is one particular feature that especially excites me -- the ability to attach comments to text ranges. This feature alone is a boon to authors and editors. And that's not to mention the other features. I'm duly impressed! I'm going to leave it alone for a bit and see how it turns out. As with any new software, I'm sure there are existent bugs that are going to have to be addressed. I don't know how long I'll be able to wait, though. I'm going to start by seeing if any of the dependencies for my OSes will break the system if I install them. They do have a .deb file for the suite, and I'm sure Windows won't even hiccup. Looks like some great features have been added this go around! I used an editing program once that linked parts of a document to a note file. You might remember it, all you did was place an up arrow and tilde side by side on the document and it would add a number (the next number on the notes stack). It became a link that you could click on to see the notes. They did not print when printing out the document! An early form of Scrivener? I still prefer Kabikaboo for my first draft work, and the ability to move things around so easily. StoryBook4 drives me nuts trying to use it. So it sits there unused now. When I'm working on the second draft, I make a copy from Kabikaboo into Gedit. My second draft is still more like a first draft. But I can have Kabikaboo open on one computer screen and my Gedit on another screen. When I'm finally done getting things in the order I want and rewritten, I then close everything and move the document to OOwriter. An editor I have worked with in the past, prefers getting an ODT file, simply because DOC adds so much garbage and messes things up all too often for his liking. What is funny about this guy is, he doesn't run Linux, he still uses windoze. But loves Open Office over Word.